For the Onassis Cultural Center in New York, Lemos is presenting Perpetual Transitions, yet another evocative installation of boats, suspended as if they were sailing across the gallery’s spacious atrium with its fortuitous waterfall. 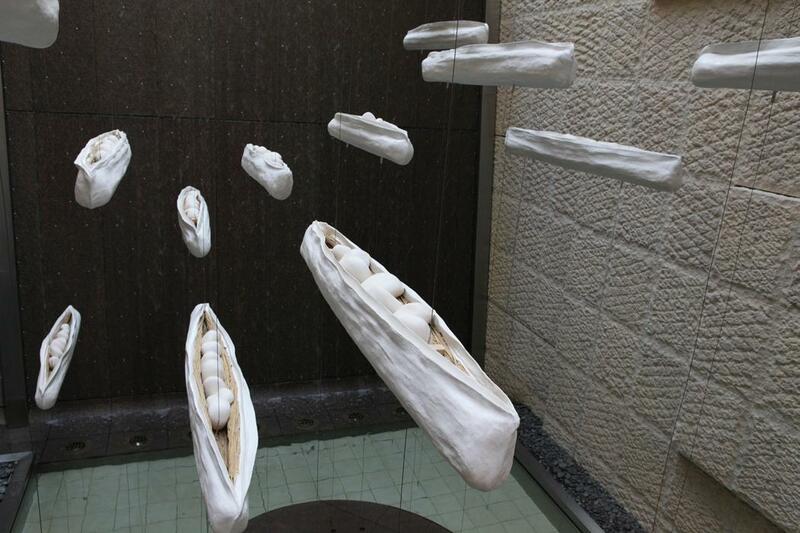 She calls the immaculate, ghostly white, archetypal vessels “bean boats.” Shaped liked pods, they resemble not only boats—which could be viewed as houses turned upside down—but also wombs, repositories of seeds, or reliquaries emblematic of the cycles of birth and death, transitions and salvation. Think of Noah’s Ark, that ultimate loating shelter for both Christianity and Judaism. Slender, spare, lightweight, measuring about 2.5 meters (8.20 feet) in length, the boats are made of plaster, although her boats are often built from reeds. Lemos is partial to such natural materials, including also clay, salt, sand, wood, and crystal, as well as man-made metals, which despite their seeming inviolability are still vulnerable, subject to change. The edges of the bean boats are pleated, suggesting labia, and the interiors are filled with smooth, white plaster globes. Each globe its snugly in the hollow of a pair of cupped hands, seemingly molded to them, an effect that emphasizes the process, as if the forms were the result of being held and touched, again and again. Lemos is also deeply invested in the tangible, in three-dimensional materiality, and it is this innate preference that diverted her from painting, her first choice, to sculpture. 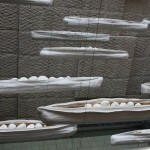 The seven elements in each of these boats—seeds perhaps or eggs—represent the interdependence of the corporeal and the animating spirit. Together they symbolize the whole.